shrimp – Don't Forget the Cream! This is actually two dishes that can be mixed and matched in thousands of ways. The Risotto is great alone, with seafood, you will find it under my short ribs, almost anything you can imagine, including as a dessert with a few minor ingredient substitutions. The magic of risotto is discussed in its featured post, so let’s get back to the shrimp. If you follow my blog, you know that I am a use-what-you-have-on-hand cook, and that I cook gluten-free. That means, feel free to experiment with flavors that you love! I have a rule at my house that if something doesn’t work, we order pizza. Done. This is one of those meals that I made to actually clean out the refrigerator. But in the end, like a mixed breed puppy, it was really good. One more confession – I did not make this meal with the intent of creating a blog recipe. Only after being asked via facebook (yes, I am food poster on fb), that I decided I would do it. Because of that, my pictures will be replaced the next time I make it, and this is my apology that there are not any “in process” photos to explain a step. Lesson learned. Final thought on the shrimp – Yes, you can absolutely use peeled and deveined shrimp, and if you are in a hurry, please do! I use the shells to make seafood stock, if you are just going to throw the shells away, save yourself the time. Just never, ever, not-in-a-million-years, buy pre-cooked shrimp for this recipe. Never never never. 12 Prawns, shelled and deveined (when you shell shrimp, save the shells! See my post for seafood base and shrimp bisque for their use.) If you use smaller shrimp, just use more shrimp and lessen your sautee time. Peel and devein the shrimp – yes you can buy peeled shrimp, see my discussion above. In a heavy sauteé pan, I use a 16″ cast iron, preheat to medium heat and once hot, brush a layer of olive oil and sauteé the bacon until crispy, then drain on a paper towel. Turn down the heat on the oil to medium low! Leave a 1/8″ layer of bacon grease in the pan, if there isn’t enough, add a little olive oil. Add the shrimp, cook for about a minute, then turn and cook for one more. Add the vodka or wine, and ONLY sauteé until the shrimp loses its translucency and is pink, then immediately remove and set aside. If you use smaller shrimp, continuously stir in the pan and remove as soon as you see pink. 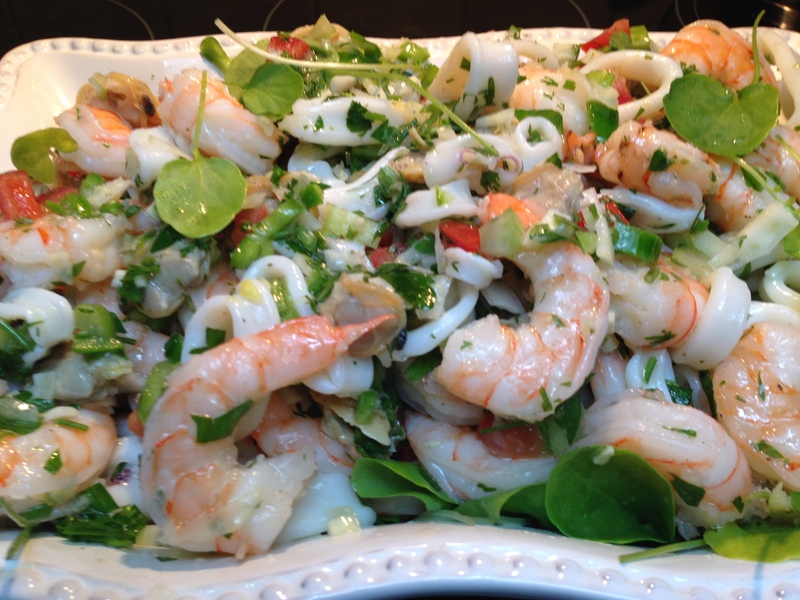 Add the shrimp and arugula and stir together. Add the bacon, stir, cover and set aside for 2-3 minutes to rest. Add salt and cracked pepper to taste, serve over risotto and enjoy! To finish the meal, serve with roasted carrots. 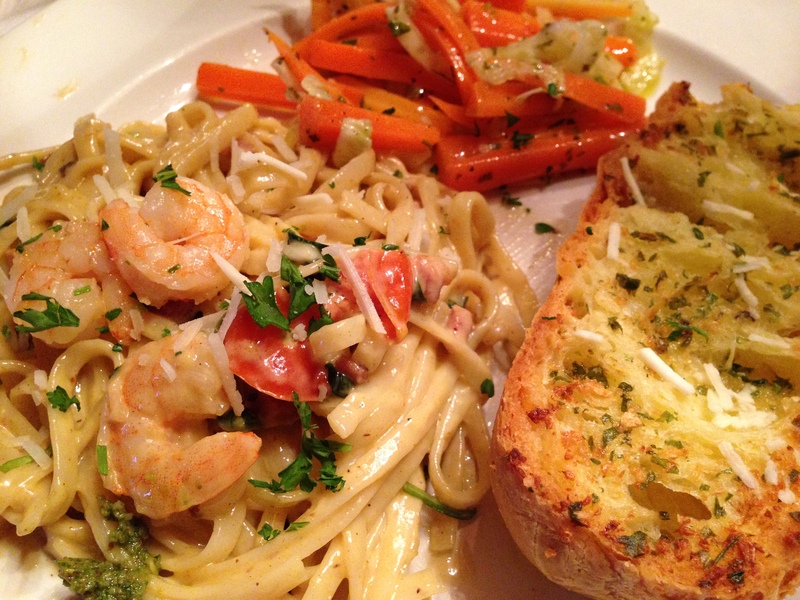 GF Linguini Alfredo with Shrimp Scampi, served with carrots sauteed with leeks and garlic bread (yes, it’s gf too). Okay it’s a little bit of a combination of a few great classics. Sometimes when I’m cooking gf, it becomes a mashup. That’s how I roll (groan now). Until our local grocery store began carrying fresh, gf pasta, dinners such as this were non-existent. While there is a place for everything, I find few uses for dried pasts, gf or not. The few times I made a sauce and used a dried corn or rice flour based pasta, I was disappointed. It wasn’t bad, it just wasn’t worth a repeat effort. The fresh pasta changes everything! It is so close to a wheat based flour pasta I can hardly tell the difference. We are fortunate, our grocer carries gf linguini, fusilli and lasagne sheets, allowing us to make many recipes we otherwise wouldn’t enjoy. And for that I say, grazie. This dish is not just tasty, it is quick. You can have dinner on the table in less than 30 minutes after your shell and devein your shrimp. Oh, the shrimp, everyone has their own opinions on shrimp, and I am not one to not have an opinion. Ever. But that’s another story….back to the shrimp. I buy only uncooked shrimp. They are so quick and easy to steam, even when you are in a hurry, that I have never understood why you would risk buying pre-cooked, a/k/a bland and flavorless, shrimp. There are more and arguably better, reasons too. You have shells to use to make a seafood stock; you can cook the shrimp right in your sauce to add depth of flavor; you ensure the freshness of the shrimp, and, my favorite is that if you are cooking a meal, you should never ever ever never ever start with pre-cooked meat. Ever. Now for the recipe. Wait, a last observation. This is my version of two classics, but certainly not the only versions nor necessarily authentic. If I was making only an alfredo, the recipe would be a bit different, but becasue of the added flavors of the scampi, it is slightly toned down. Okay, that’s my disclaimer, now go cook! 3/4 c. grated parmesan cheese (the real stuff, not from a green can) plus more for garnish. 1. Melt the butter over medium low heat. When it begins to bubble and before it browns, add the garlic and sautee for 30 seconds. Do not brown the garlic! 2. Add your shrimp on an even layer and do not touch it until you see it begin to turn a beautiful shade of orange half way up the side; turn. 3. Continue cooking the shrimp, without touching them, until they are no longer translucent, about 6 minutes in total. When the shrimp are fully cooked, squeeze the lemon over the entire pan and swirl. 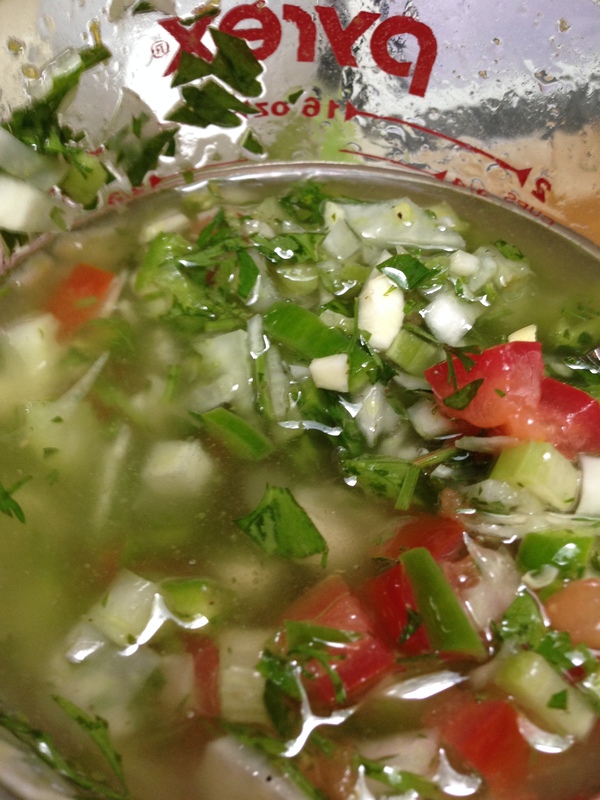 Add the chopped parsley and top with fresh cracked pepper. Remove from heat immediately, add the tomato, cover and set aside. 1. Place a large pot of salted water on the stove and keep at a simmer, this will make cooking the pasta quick as soon as your sauce is ready. 2. Heat a medium size sautee pan to medium low to medium, depending on your stove. You do not want to scald the milk. 3. Add the milk and warm it. When it begins to steam, add your cream. 4. When the mixture is steaming, add your cheese and stir with a spatula frequently, to melt the cheese. 5. Once the cheese is fully incorporated, remove from heat and add the nutmeg, and pepper. Be careful to not add additional salt until after you taste your sauce, the parmesan will add considerable saltiness. If it needs additional salt, add it in small increments. 6. After the sauce has cooled a bit, stir in your egg yoke. BE CAREFUL to not do this too soon, or you will have scrambled yoke in your sauce instead of creaminess. Put a lid on over your sauce while you cook the pasta. Fresh pasta should only take 2-3 minutes to cook, and will reheat your sauce just prior to serving. 7. When the salted water comes to a boil, add your fresh pasta and stir. Check for doneness at the earliest cooking time indicated on the packaging. 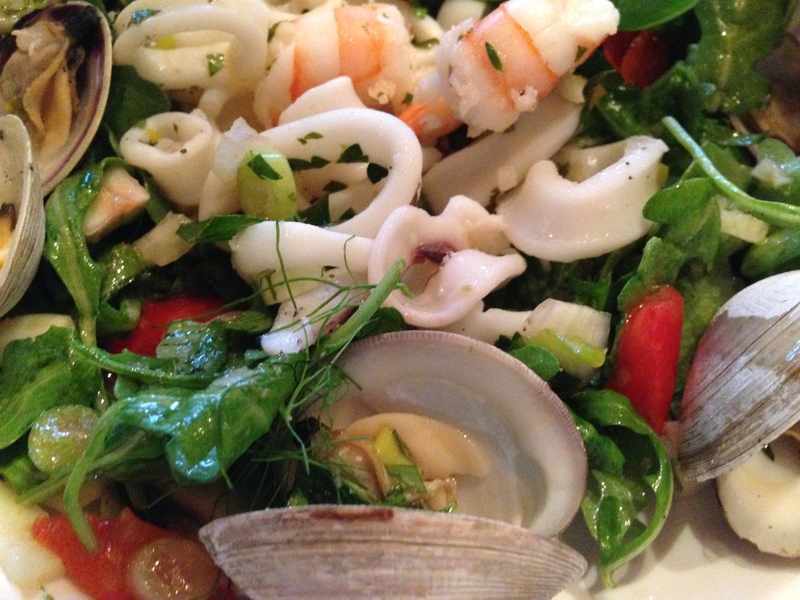 It is important to keep your pasta strong (al dente) to hold up to the sauce and seafood. Do not overcook. Strain the pasta, shake once or twice and then add to your sauce, incorporating gently with rubber tongs. Plate your pasta, sprinkle with more cheese and top with shrimp. Garnish with a bit more of the chopped parsley.